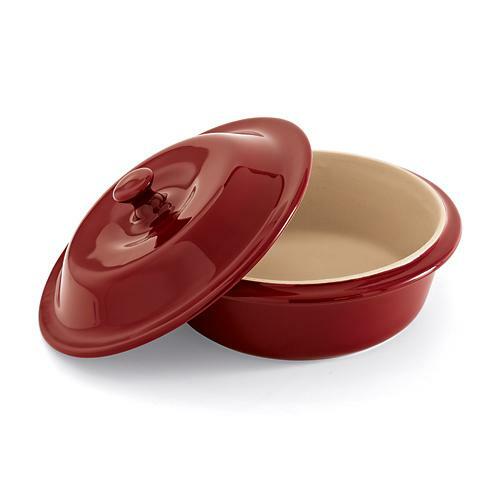 I've loved Pampered Chef products for a long time but one of their most popular lines I've only recently become a fan of and that's their Stoneware. The whole stone sometimes can scratch it like nails on a chalkboard thing always freaked me out. Man I was sooo missing out and didn't even know it! I'm a convert now and want to tell you about my new favorite piece ... the Round Covered Baker. This little guy is amazing. If you've ever used the Deep Covered Baker and loved it, you will go gaga for this guy. It's perfect for my husband and I since it's still just the two of us but even if you have more than 1-2 in your family this guy would be awesome for side dishes and smaller desserts. One of my favorite things to cook in it are potatoes or if you're like us and trying to eat healthy, sweet potatoes. The best part is it only takes 15 minutes in the microwave! I know right? 2. Add a little water (to help steam them) then cover. 3. Microwave the potatoes for 15 minutes (times will vary for each microwave). Halfway through move the two in the middle to the outside. Our potatoes came out perfectly cooked last night they were delicious and soft mmm! Another of my favorite things about this little guy is that anything the Deep Covered Baker can do this can do smaller. Like the Loaded Baked Potato Chowder (one of my favorites) or Microwave Rocky Road Brownie Dessert ... yeah it's a brownie in the microwave and it's to die for, my mouth is watering as I think about it seriously. Awesome giveaway! So perfect for all the bakers and chefs out there!